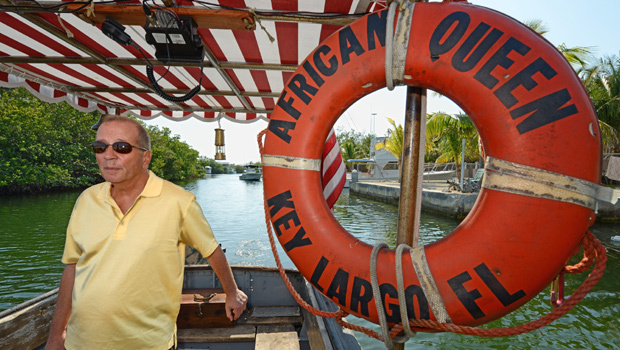 (CBS/AP) Stephen Bogart, the son of actor Humphrey Bogart and Lauren Bacall, helped re-launch the newly restored African Queen riverboat that appeared in the classic 1951 movie of the same name starring his father and Katherine Hepburn. Stephen Bogart, who lives in Naples, Fla., was present during event on Thursday for the vessel registered as a national history site. Keys sailing charter operators Lance and Suzanne Holmquist inked an agreement with the 100-year-old boat's owner and invested some $70,000 to restore the boat. Next week, the Homquists are to begin daily curises for Keys visitors from Holiday Inn Key Largo. In a rare interview Tuesday, Jared Kushner characterized Russian interference ​in the 2016 election as a "couple of Facebook ads"
Some of the Democratic presidential candidates for 2020 are expected to speak at an event focused on issues that matter to women of color. CBSN political reporter Caitlin Huey-Burns is covering the forum in Texas. The Trump administration is defending its plan to ask about citizenship on the 2020 census. Critics warn the question could discourage immigrants from filling out their census. Jacinta Ma, director of police and advocacy at the National Immigration Forum, joined CBSN to discuss.